We are witnessing a profound paradigm shift in the manner in which urban K-12 educational services are delivered. Urban public schools have seemingly abandoned hope. Right before our eyes, the traditional urban public school systems of our youth die a tortuous, slow and excruciatingly painful death. Constant pressure is being applied with great force to the “throat” of urban public school systems. This asphyxiation of public education in places like Philadelphia, presents a tremendous opportunity for Catholic, Private and other tuition-based schools to dramatically increase their enrollment figures. We are in the midst of a period of “public education austerity,” which has been gaining traction for several years. Deep and sustained administrator, teacher and guidance counselor layoffs accompanied by widespread school closings and service cuts are clear symptoms of this particular disease. These massive human resource reductions and school shutterings have been instituted with alarming consistency in low-income urban areas across the nation. They are part and parcel of the trend toward a “Portfolio” management model in urban education. Chicago, New Orleans, New York City, Camden and Philadelphia are among the large urban districts that are shifting from a centralized bureaucracy that directly manages traditional neighborhood based schools toward the Portfolio model in which District Administrators enter into contracts with a few public schools, privately managed schools, and charter schools. Last year alone, Philadelphia closed 29 schools. Chicago closed 49, New York 26 and Washington, DC 15. Other urban areas transitioning to this Portfolio Management approach are Baltimore, Cleveland, Los Angeles, Oakland, and Washington. A key feature of this strategy appears to be economic strangulation of the remnants of traditional neighborhood schools. Given the fiscal constraints facing administrators of traditional urban schools, continued abysmal academic performance is inevitable. Of course, this will lead to more and more school closings. National education management organizations (EMOs) and large corporate charter operators will continue to gain a larger share of the urban public education market. Or, so they think. Portfolio models have emerged in wide range of strategic environments, but they have an important limitation. In each of the aforementioned cities, the “shot callers” – politicians, board members, superintendents, etc. – have made their move. For example, the School District of Philadelphia has shown its’ hand. Now other “players” have an opportunity to react and respond accordingly. In “real life” all of the players in the “urban education market” players don’t choose their strategies simultaneously. Instead, the game transpires over time, with players making “moves” to which other players react with their own “moves.” Here I explore the likely “moves” of the tuition-based schools, represented by the Archdiocese of Philadelphia and urban low to moderate income parents of school age children. It is important to note that the School District of Philadelphia’s educational “shot-callers” may not have fully considered the extent to which the timing of strategic decisions is important. Despite years of sad stability, the urban educational service delivery “market” is potentially a dynamic and constantly changing strategic environment. The shot-caller pay lip service to this fact. Proponents of the Portfolio model argue that it allows districts a degree of flexibility unavailable under traditional service delivery models. What they fail to appreciate is the extent to which their actions could lead to a mass exodus of students from the public school system altogether. For years, urban public school board members, superintendents and administrators operated as a de facto monopoly. The actual consumer of public schools — parents and children — exercise very influence as the schools have become more and more centralized and bureaucratic. Over the past 60 years or so, the number of school districts declined from 130,000 to 16,000. The system is top-heavy. Classroom teachers once represented 96 percent of the total instructional staff. Today they are about 86 percent. Federal and state resources have superseded local government as the leading source of school funds. The local percentage dropped from 83 percent to 43 percent. While population has almost doubled, the cost per student multiplied more than five-fold, even after allowing for inflation. By any reasonable measure, the quality of urban education has declined precipitously. Urban public school systems are now run by professional bureaucrats. Monopoly and uniformity have replaced competition and diversity. Over the past five or six years, these bureaucrats began shifting to a ‘Portfolio’ management model in cities across America. In doing so, they are opening the door for high-quality alternatives like Catholic, Christian and Independent tuition-based schools to siphon off students in large numbers. A more extensive and informative analysis necessarily includes a more complete set of players. Urban school districts aren’t acting in a vacuum. For present purposes, I consider three (3) sets of players: 1) The School District of Philadelphia, 2) The Archdiocese of Philadelphia and, 3) urban parents of Philadelphia’s public school students. Perhaps, most importantly, there is no assumption that urban districts can close schools, cut services, lay off teachers and other staff members with impunity. Rather, I look at their recent moves when and spell out what their choices entail. I explore what the other know when they move. Finally, I examine each set of players‘ payoffs as a function of the choices that are made. 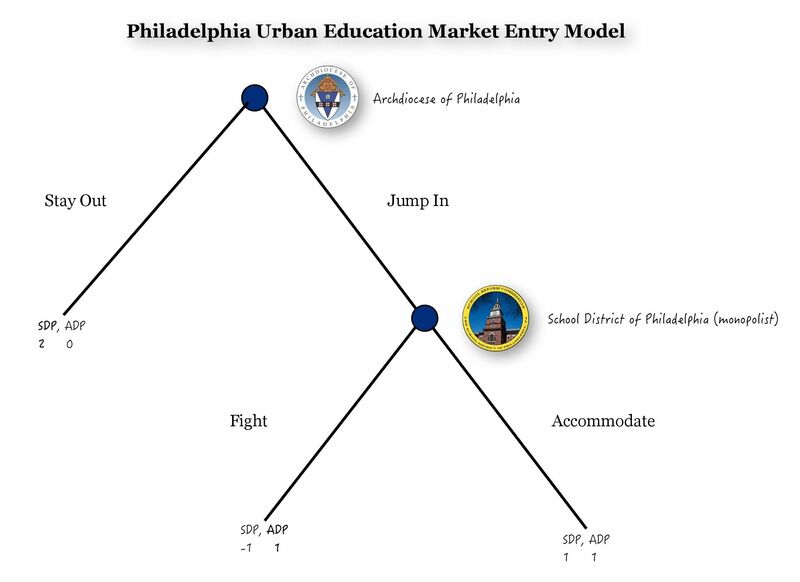 In the Philadelphia Urban Education Entry Model illustrated below, the School District of Philadelphia (SDP) is an incumbent monopolist. As of December 2013, the SDP consisted of 214 schools. This figure includes Promise Academies and excludes Early Childhood, Alternative Education Programs, and Charter Schools. The SDP enrolls over 131,000 students in these 214 schools. Another 6,982 are enrolled in Pre-K programs, 3,558 are in Alternative Education programs and 229 are in Virtual Academies. The School District of Philadelphia is also responsible for establishing and maintaining high standards for its charter schools, including ongoing monitoring of charter performance against clear standards and implementing consequences for not meeting standards. As such, the SDP currently “oversees” 86 charter schools with a total enrollment exceeding 60,000. While charter schools have a degree of administrative autonomy, they are ultimately accountable to the School District of Philadelphia. Indeed, six (6) charter schools are currently in the midst the Nonrenewal/Revocation Process in which the District’s School Reform Commission is attempting to permanently close the schools. For strategic purposes, I consider them part of the District. With regard to urban education, especially of low to moderate income minority students, in Philadelphia, the SDP is a virtual monopoly. 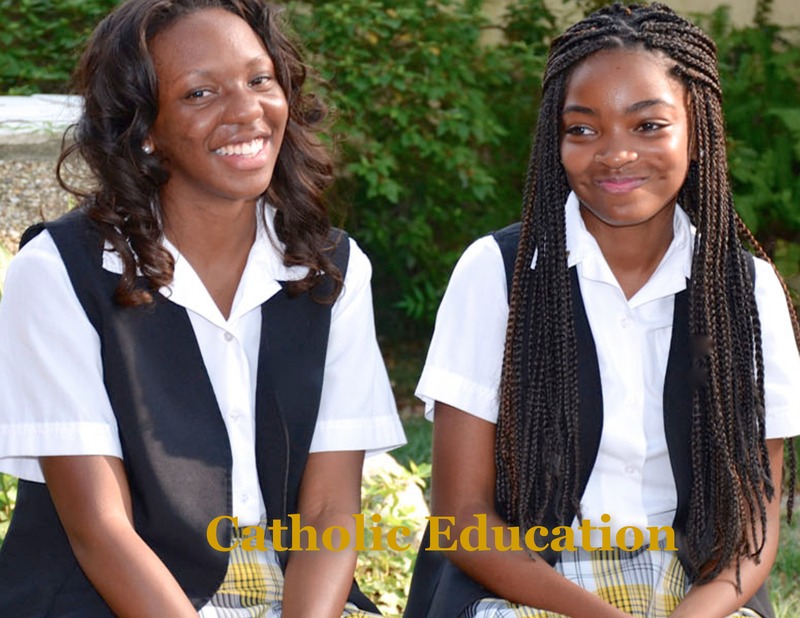 The Archdiocese of Philadelphia, has smaller but relatively stable presence in Philadelphia’s urban education market. With the abysmal academic performance of SDP schools, the Archdiocese has an opportunity to aggressively enter the urban educational market. Plainly stated, they can make a push for Black and Latino students that are currently underserved by dysfunctional public schools. The strategic situation is represented the above diagram. If the Archdiocese decides to “stay out” of the urban student enrollment market, the district would not lose students and the payoff for the SDP is 2. Under that scenario, the Archdiocese would not gain any additional students and their payoff would be 0. But, we can immediately eliminate this payoff option. 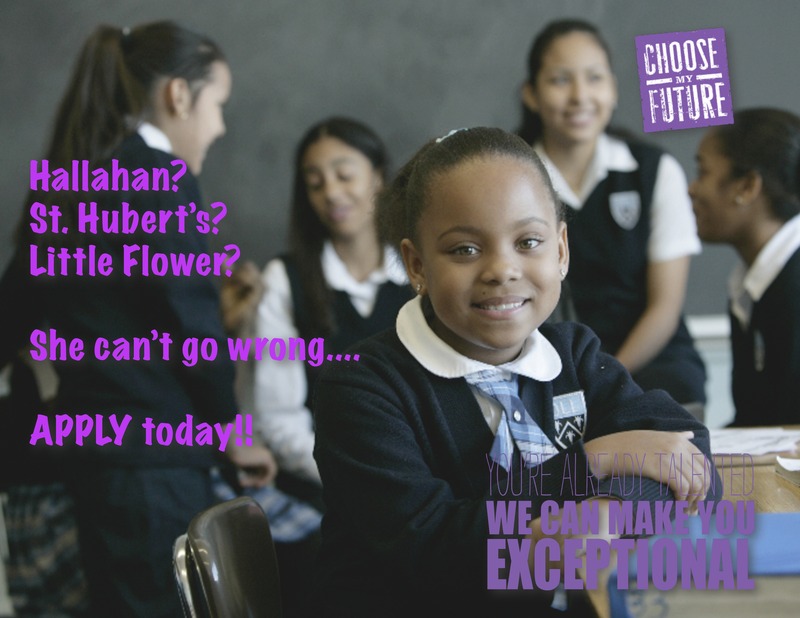 The Archdiocese has decided to “jump in” the the urban enrollment market. Indeed, their commitment to attracting minority students is very real. 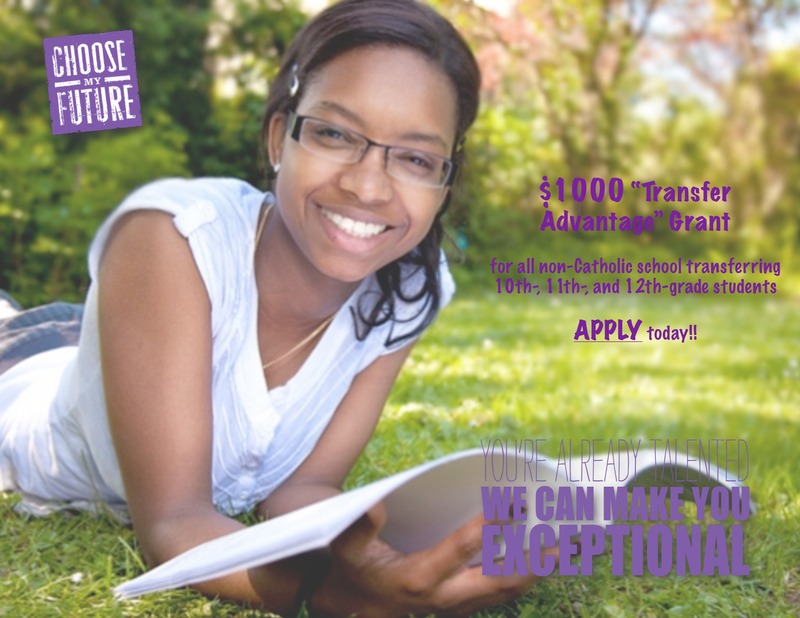 Toward that end, the nonprofit foundation that manages Catholic high schools in the Archdiocese of Philadelphia is offering $1,000 grants to encourage students to transfer to the schools. Christopher Mominey, chief operating officer of the Faith in the Future Foundation and the archdiocese’s secretary for Catholic education, said the new “transfer advantage” grants were part of the effort to boost enrollment at the 17 high schools. He said the foundation wanted to attract students who were not enrolled at Catholic high schools but were interested in learning more about them. Within Philadelphia’s city limits, these students are predominantly Black, Latino and Asian. The Archdiocese is currently planning mount an aggressive targeted marketing campaign to engage minority families. This effort will be spearheaded by Nick Regina, Deputy Secretary for Enrollment Management. With the Archdiocese aggressively competing for urban students, the SDP, theoretically, will have to choose how to compete: either aggressively (fight to keep their students), or by ceding enrollment share (accommodate). The strategic situation faced by the SDP is represented by in the diagram by the choices “fight” or “accommodate.” Again, we can immediately eliminate one of the scenarios. The district, quite frankly, is not in any position to fight. Even if they wanted to market themselves, it would be a very, very tough sell. 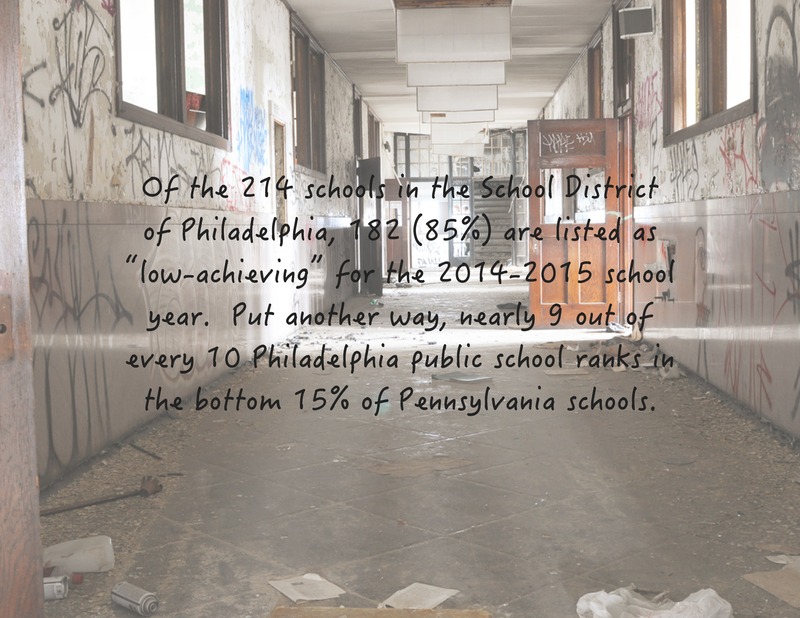 Of the 214 schools in the School District of Philadelphia, 182 (85%) are listed as “low-achieving” for the 2014-2015 school year. Put another way, nearly 9 out of every 10 Philadelphia public school ranks in the bottom 15% of Pennsylvania schools. Moreover, it’s virtually impossible to find a traditional neighborhood school that is not low-achieving. The performance levels are so poor that the Pennsylvania Department of Education has determined that students residing within the boundaries of a low-achieving school are eligible to apply for scholarships to attend another public or nonpublic school. In effect, the state of Pennsylvania is telling parents to seek better educational settings. Hence, if they expended any of their scarce resources on a marketing/recruitment effort, they would necessarily take away from their ability to deliver educational programming. As such, the student experience within the district could only become worse. Thus, the decision to “fight” result is payoff of -1 for the SDP. At the same time, the Archdiocese will gain an increased enrollment share. The ADP payoff is 1. Thus, the far more likely scenario is one of accommodation. One could almost see this coming. Three years ago, the SRC joined the city, state, District, and two of Pennsylvania’s largest charter umbrella organizations in joining the Philadelphia Great Schools Compact. The group was given a $100,000 planning grant by the Bill & Melinda Gates Foundation. The stated aim of the compact is replacing or transforming 50,000 seats in low-performing schools with better options, without regard to whether the schools involved are operated by the District or a charter organization. The Great Schools Compact is the engine driving the push toward a “Portfolio Management” model in Philadelphia. Why would they oppose an increased number of students enrolling in tuition-based schools? Clearly, Catholic schools are a “better option.” By any reasonable measure Catholic schools outperform public and charter schools in Philadelphia. 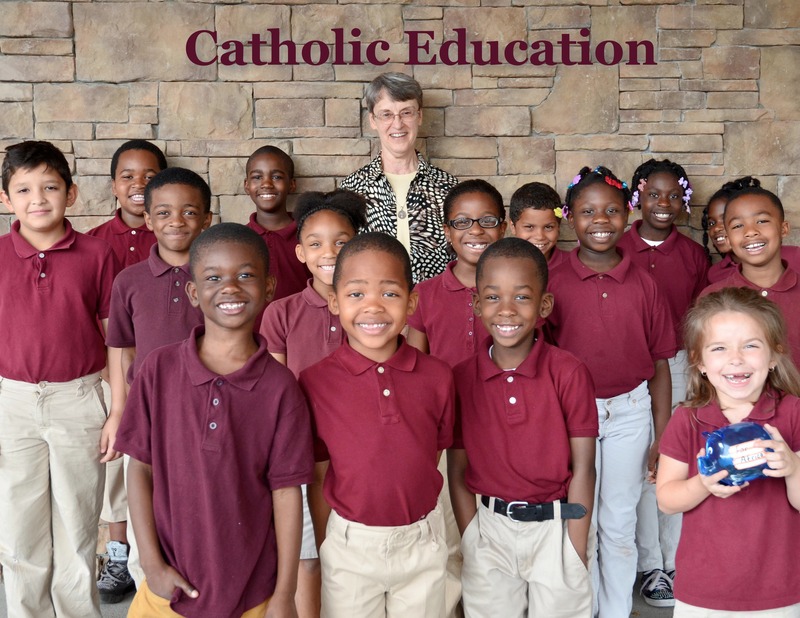 Over 98% of the elementary schools in the Archdiocese have been accredited by the Middle States Association, and the remaining 2% have completed the process and are awaiting their status. More than 4,000 students participate in Elementary Honors Math Programs in 78 Archdiocesan schools. These students are prepared to participate in advanced-placement mathematics courses at the secondary level. World Language instruction is offered in 102 elementary schools. Fine Arts programs are in existence in every Archdiocesan school. Students from Archdiocesan schools have taken top honors in the Future Cities competition as well as in county and regional science competitions. 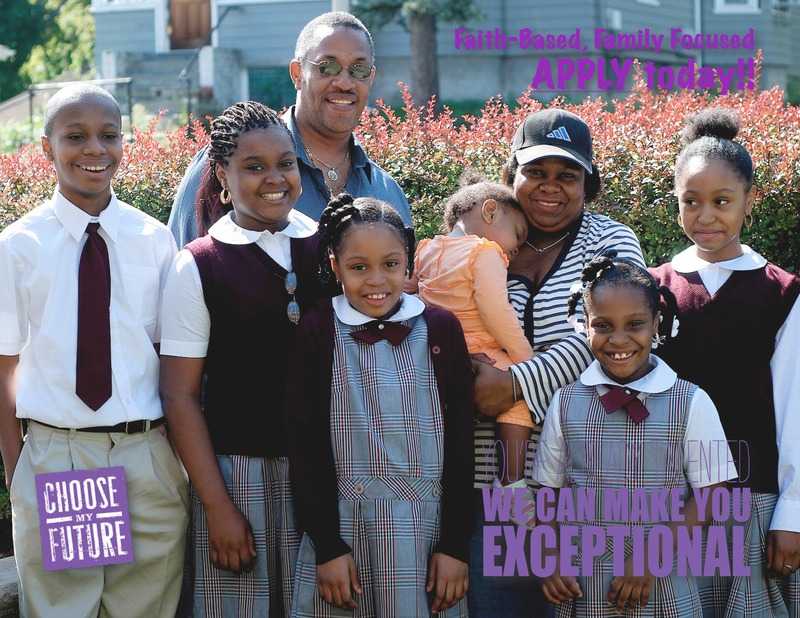 The question becomes: How does the Archdiocese identify and connect with urban parents desiring access to high-quality, safe educational settings on a regular and consistent basis? How do they overcome the seemingly “irrational” tendency of parents to enroll their children in low-achieving and highly dysfunctional public schools? The fact is far too urban many parents exhibit educational decision-making that can, perhaps, be best described as irrational or behavior without clear educational goals in mind. First and foremost, Catholic School enrollment management and admissions professionals must understand that marketing/recruitment approaches that have worked with their traditional populations are limited by time and culture. The Archdiocese has begun to make significant inroads in that area. Schools like West Catholic HS, Roman Catholic HS and Bishop McDevitt have significant minority student populations. The staff at these schools have developed recruitment strategies that have been well-received by minority parents. However, many low to moderate income parents continue to exhibit educational decision-making that is very distinct and subculture-bound. To be effective, Archdiocese representatives must better understand that enrollment decisions which “on their face” appear irrational may indeed be sensible. This is an important and difficult task to accomplish. It’s difficult because in many instances educational decision-making takes forms that typical private school parents would consider irrational. Nonetheless, these behaviors are sensible because they are well adapted to the “real world” situations faced by low to moderate income urban families every day. By “well adapted” I mean enrolling kids in neighborhood public schools satisfies the legal requirement that children attend school without the occurrence of destructive personal stress. In all American urban centers, to a greater or lesser extent there exists a subculture of the poor. People on the lower end of the economic spectrum view things differently than those on the middle and upper ends. It’s exceedingly hard out here for many, if not most, urban families. In real terms, the nation’s 2012 household median income of $51,017 stood at the lowest level since 1995. Median income peaked in 1999, at $56,000. In 2007, the national median household income stood at $55,627. But it has fallen every year since. When inflation is removed from the equation, median income fell 5.5% from 2005 to 2012. Most Philadelphians are much worse off than the average American. Philadelphia’s median household income was $34,207 in 2011, according to a census study. With half of Philly’s households below that figure, it’s not difficult to identify people struggling to make ends meet and keep a roof over their head. Enrollment decisions for these folk conform to the notion that actions are taken to avoid pain, not to maximize educational benefits: to cope with pain, or minimize it, or to minimize its very perception. This behavior is not likely immediately recognizable to Catholic School administrators as “sensible” action. I suspect that much, if not most, urban parental behavior broadly considered is designed to minimize pain. Dealing with daily inexorable pressure and overwhelming frustrations, many low to moderate income parents desire a predictable life. They don’t need to enroll their children in a private or parochial school only to discover that they will be unable to meet tuition payments. They want to reduce the precariousness of life. They want to know that their children will be able to attend a school and they will therefore comply with truancy laws. Many have a hard time understanding apparently irrational resistance to well-meaning attempts to improve access to quality schools. For those unfamiliar with life in the “hood” the educational choices of many urban parents is not immediately recognizable as sensible. How can we help parents better understand the range of available options? It needs to be understood that educational decision-making intended to minimize pain is widespread in urban centers because it has deep roots in the basic, inescapable need to avoid tension and stress in a world quite correctly perceived to be hostile and unpredictable. Urban minority parents literally have to worry the thug element and the police harming their children. Will their boys be safe from police or harassment or worse traveling everyday through predominantly white neighborhoods. Unless Catholic educators/recruiters take this fact into account they will continue trying to engage urban families with strategies that are totally irrelevant to their day-to-day existence. There is a need for a new debate, a new discussion with vastly different parameters. In recent years, debate surrounding urban educational issues has tended to be narrowly circumscribed. Print and TV media outlets and pundits have focused on a very narrow range of issues. They tend to frame the argument in the following manner: Should public school districts and their supporters focus attention on how to provide quality schooling with, admittedly, dwindling and insufficient resources? Or, alternatively, should school districts and their supporters continue waging (losing) a struggle to gain additional public funding? The Archdiocese of Philadelphia is adopting a very different approach to the problem of urban education. They can begin from a point which assumes that parents, guardians, grandparents and other educational placement “decision-makers” are potential consumers. That is to say, their behaviors could be influenced, subject to information and opportunity costs. The Archdiocese is assuming that, once fully informed, individual urban parents will want safe high-quality educational settings for their children. Like everyone else, Black, Latino and Asian parents will want to access the “best” schools, once they understand that it is truly achievable. They know that many urban parents, however, possess a very limited understanding of the Parochial school application and financial aid process. As a result, their ability to determine their “best interests” and make informed educational decisions is constrained both by perceived limited financial situations and limited understanding of the processes. This is not accidental. Urban school districts, charter school operators and the media have managed to successfully frame the discussion in such a manner that Catholic, Private and Independent school options are, generally speaking, excluded from consideration as viable options for low to middle-income urban families. The Archdiocese recognizes that most urban parents don’t know much about how Catholic schools work. These parents don’t understand that with available financial aid, they could access quality elementary schools $250, $300 or $350 per month depending on their respective financial situation. They recognize that within urban minority communities, there is significant variation in the extent to which attention is focused on educational issues, People have different spans of attention and parents have different levels of education. In short, they know parents need help determining what is the “best” educational setting for their children. Many, in not most, parents and students have no idea how bad their current situation actually is.